That title is deceiving. Batman won't make an appearance on this manicure. 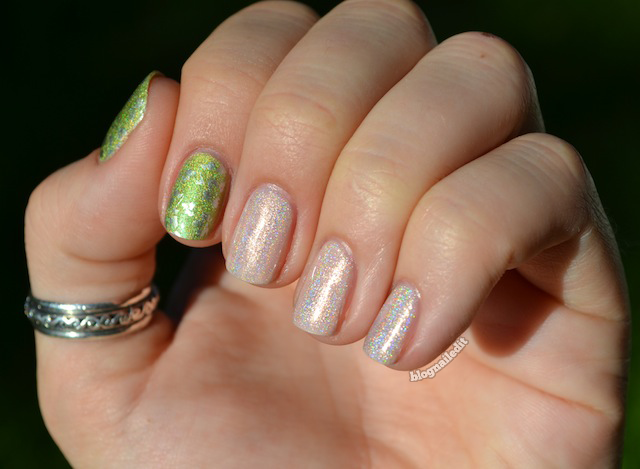 This manicure is all about the holo. It's really difficult for me to steer my polish choices for nail art away from creme finishes, but it's pretty easy to dip into the holographic spectrum...especially with the Spectraflair top coat I got from Pretty Polish n' Things. I've had this top coat laying around for a while, and never used it. I ordered two mini bottles, but one of them was a complete dud. If you paint it over a color, it just makes it grey...not holographic. I was so disappointed with that that both bottles just found their way to the back of my drawers collecting dust. Then yesterday when I was trying to come up with a design idea, I grabbed a green holographic from China Glaze (Laser Lime) and decided I wanted to give it another try. I'm glad I did. The Spectraflair top coat is used over Petal Pusher (Sally Hansen Insta-Dri). I don't know what it was about last night, but I wanted to bust out some unused and old polishes. Petal Pusher is one of the first polishes I bought before this blog began, back in at least 2010. It's still working too, even after being half-way used. I'm not sure what voodoo is keeping it alive, but I hope it sticks around for some of the glitters in my drawer. The trigger fingers were both stamped with Silver Sweep (Sally Hansen Insta-Dri) and BM-221. It was so sparkly and fantastic that I waited until daylight broke out again to take pictures. (All my other pictures are light-tent-taken.) It looked great over the grass too! man! I hate when your so exited about something only to purchase it and it's crappy man! so glad you got some use out of it because it looks amazing! 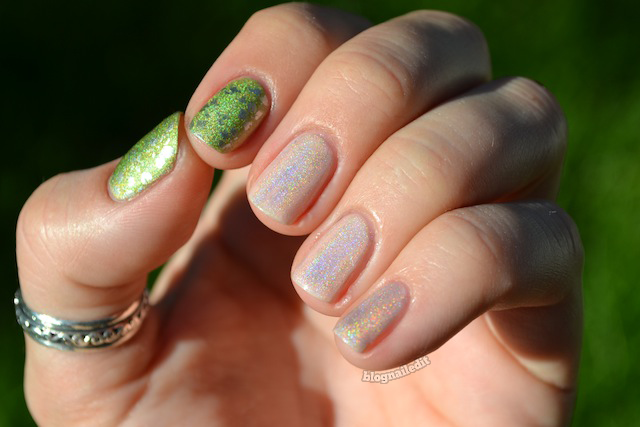 where would one buy the spectra top coat?